9:30 Arrive and settle. Enjoy a coffee and tour the gardens. 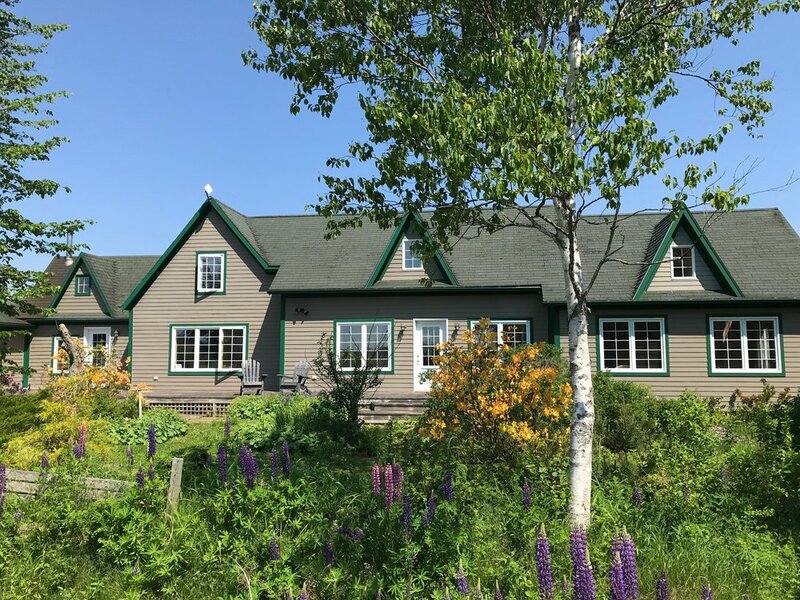 The Hideout is located in scenic North Tyron, located just off the Trans-Canada Highway near Crapaud, about mid-way between Summerside and Charlottetown and ten minutes from the Confederation Bridge. Price includes the full cost of a vegetarian lunch and coffee, tea, and treats throughout the day. Questions? To secure your spot in the retreat, full payment is required at the time of registration. To register or for more information, contact Trevor at trevor@trevorcorkum.com. Enjoy a meandering walk along Lord's Pond, including this soothing water view from the floating bridge. Make it a full weekend and pamper yourself with a night or two at our private one-bedroom cottage, facing west to some of the most gorgeous sunsets on the Island. As the glories of summer transition into the first days of fall, give yourself and your writing the nourishing gift of time. This full-day workshop is designed to provide you luxurious space and adequate support and encouragement to go deeper with your writing. Get your creative juices flowing, rekindle your motivation, and soothe your senses at The Hideout, our bucolic countryside retreat. The Hideout is an idyllic place to set your worries aside and sink more deeply into your craft. Surrounded by rich woodland forest, the protected Lord's Pond watershed, and the soothing sound of birdsong, the light-filled Hideout studio provides the ideal setting for a full day of writing. In the morning, we'll engage in a series of writing activities, responding to prompts and looking more closely at key elements of craft. After a sumptuous vegetarian lunch and time outside, we'll spend the afternoon working with our individual writing projects, creating together in a supportive and structured environment. You'll have full access to sun-bathed common areas, with wide tables and cozy corners to hunker down in. Or write outside on the verandah in one of our Muskoka chairs overlooking the peaceful countryside. No prior writing experience necessary. If you're new to writing, this will be a supportive and encouraging place to start. The workshop is open to writers of all genres, but may particularly appeal to writers of fiction, nonfiction, and memoir/life writing. Prepare to respond to writing prompts and bring a sense of curiosity, creativity, and play to the day. Participants can expect to complete and edit a short piece during the workshop. Limited to 10 participants. The Hideout is a fully accessible space, with ramp access, extra-wide doors and a main floor washroom. Travelling from out of province, or simply looking to pamper yourself and extend your retreat at The Hideout? We have two luxurious accommodation options available onsite. Check out our signature Cottage and our cozy Tryon Suite to make it a full weekend. Prices for accommodation start from $95/night plus HST. Check out the following retreat package options. Price includes accommodation, the full price of the retreat and Saturday lunch, complimentary continental breakfast for each morning of your stay, unlimited access to the Hideout gardens and grounds, and a curated selection of treats in your cottage. Price includes accommodation, the full price of the retreat and Saturday lunch, complimentary continental breakfast for each morning of your stay, unlimited access to the Hideout gardens and grounds, and a curated selection of treats in your suite. Looking for detailed feedback about your writing? Whether you're staying onsite or simply enjoying a full day of retreat, book a private writing consultation with Trevor for a special discounted retreat rate of $75 for a 50-minute session.